Synopsis: Illustrated upon the progress of his latest Broadway play, a former popular actor’s struggle to cope with his current life as a wasted actor is shown. Did You Know? This was the first comedy to win Best Picture since Shakespeare in Love in 1998. And it’s the first comedy to win Best Director since Annie Hall in 1977. Quotables: TABITHA: You’re no actor, you’re a celebrity. Let’s be clear on that. I’m gonna kill your play. 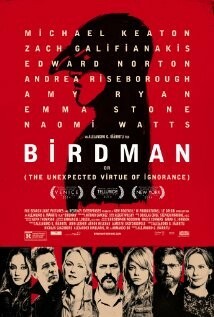 This is my favourite film from last year. I might even say that it is my favourite film ever. The acting is exquisite. The cinematography is seamlessly crafted. The screenplay is genius. It’s a true triumph.